LOUISVILLE, KY (Jan. 10, 2011) -- A throwback to another era, two-way starter Owen Marecic of Stanford University was selected the inaugural winner of the Paul Hornung Award as the most versatile player in major college football, it was announced today by the Louisville Sports Commission and Paul Hornung. The Cardinal senior started in all 13 Stanford games, nine on both sides of the ball, earning first team All-Pac 10 honors at fullback and honorable mention at linebacker. He logged an average of 110 plays per game - equivalent to nearly two full seasons - and was the only two-way starting player among Football Bowl Subdivision teams in 2010. Marecic was named American Football Coaches Association First Team All-America as the All-Purpose Player. "I am honored to accept an award that commemorates Mr. Paul Hornung," Marecic said. "Mr. Hornung epitomizes what it means to be a football player not only with his talents and versatility but also with his devotion to his teammates and his drive to excel." A senior biology major from Tigard, Oregon, Marecic helped lead the Cardinal to a school record 12-1 season, including a 40-12 win over Virginia Tech in the Discover Orange Bowl. 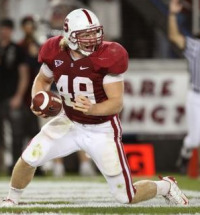 He recorded six tackles, a sack for minus 11 yards and scored on a one-yard TD plunge that increased Stanford's third quarter lead over VPI to 19-12. Paul Hornung lauded the finalists and the winner. "I want to congratulate all three players, each had a sensational year," Hornung said. "Owen Marecic was fantastic throughout the season and in the Orange Bowl. He is a complete football player - relentless, fearless and tough. He makes plays on defense, has a nose for the end zone and swallows up defenders as a blocker." On the season, Marecic rushed 23 times for 46 yards and five TDS and was fifth leading tackler with 51 stops. A bruising blocker, he also paved the way for the Cardinal to average 213.8 yards per game on the ground, which ranked 19th-best in the nation. On defense, he recorded 5.5 tackles-for-loss, two sacks, two interceptions, five pass breakups and one fumble recovery. Marecic earned honorable mention All-America, first team All-Pac-10 Academic honors and second team ESPN/CoSIDA Academic All-America honors and was a finalist for the William V. Campbell Trophy, awarded to the top scholar-athlete in college football. Marecic also was quick to share accolades with those closest to him. "I would like to thank my family, my teammates, my coaches, and Stanford University," he said. "They are the true recipients of the award because without their continued support I could not be recognized for such a great honor." Marecic had a day to remember this season on the road at Notre Dame when he scored touchdowns on both sides of the ball on back-to-back plays from scrimmage. He capped an 11-play, 49-yard scoring drive with a one-yard TD run and following the ensuing kickoff intercepted a Dayne Crist pass and returned it 20 yards for a touchdown to give Stanford a 34-6 lead. In another memorable outing, he accounted for both of Stanford's touchdowns and three tackles in a 17-13 win at Arizona State. He also had a career-best 10 tackles at Oregon in the Cardinal's only loss of the season. Paul Hornung is considered by many the best all-around player in the history of college and pro football. He won the 1956 Heisman Trophy at quarterback for Notre Dame and was the No. 1 pick in the 1957 NFL draft. He played every position in the backfield during his career with the Irish, where he also punted, kicked, returned kicks and played defensive back. Hornung was a multi-threat, all-pro halfback and prolific kicker as a member of four NFL championship teams for the Green Bay Packers. He led the NFL in scoring 1959-60-61, set the single season scoring record in 1960 with 176 points and was named League MVP following the 1960 and 1961 seasons. Legendary Packers Coach Vince Lombardi called Hornung, "The most versatile man ever to play the game." Paul is enshrined in the National High School Hall of Fame, College and Pro Football Halls of Fame and the Kentucky Sports Hall of Fame and resides in his hometown of Louisville, Kentucky, with his wife, Angela. The Louisville Sports Commission is a Louisville, Kentucky-based 501-c (3) organization committed to creating a legacy of economic and social vitality through sports. LSC attracts, hosts and owns sporting events and activities that have a positive economic impact on the City, enhance the image of the Louisville area as a premier sports destination, promote healthy lifestyles and improve the quality of life for community members of all ages. More information on the LSC is available at www.louisvillesports.org and on our Facebook fan page.